Illustrated manuscript on paper and vellum. 261 leaves, 28 pen-and wash drawings. Compilation of Chronicles in the vernacular, illustrated manuscript on paper and vellum. 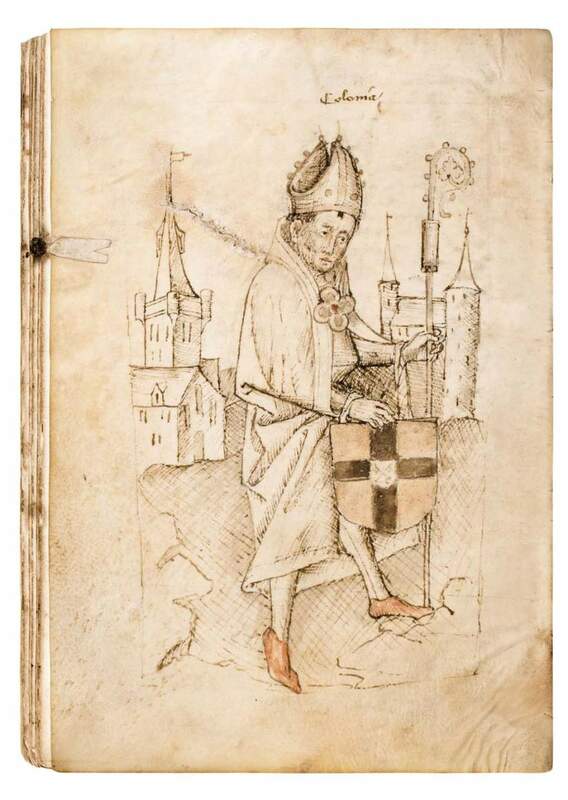 A compilation of chronicles of the Lower Rhine, illustrated with pen and wash drawings. This compilation contains chronicles of various regions in the Northern Netherlands and Lower Rhine (including Guelders, Holland, Utrecht, Brabant, Mark and Cleves), all principalities that were part of the Holy Roman Empire. It is uniquely illustrated with pen-drawings and can be dated to c. 1453-1461. It is the earliest known example of vernacular territorial, or regional historiography in the lower Rhine-Maas region and one of the very rare, illustrated, historiographical manuscripts known to exist. This work is now in the collection of Huis Bergh Castle in The Netherlands.